Osteospermum (also called Cape Daisy, South African Daisy, Sunscape Daisy and Blue-eyed Daisy) originate from South Africa. As their common names represent, they have daisy-like flowers that come in a very wide range of colors. 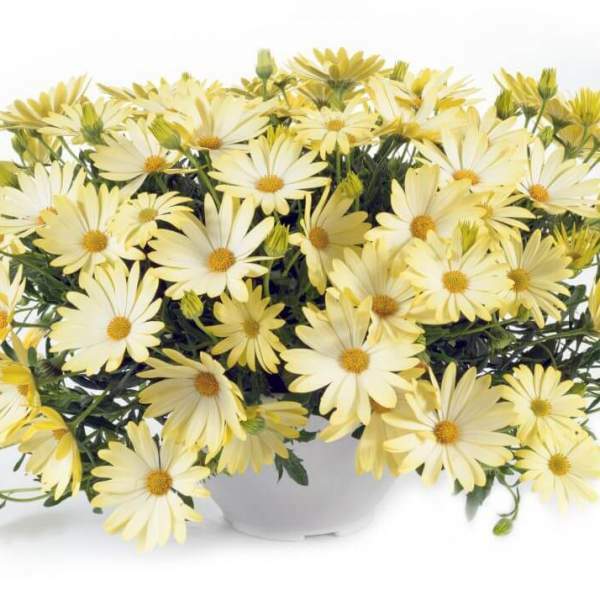 Grown as perennials in very mild climates, osteospermum perform fantastically as annuals in the rest of the country. Use these in your spring program to get some color in your garden center early. These first bloomers will accommodate your early-season shoppers along with your pansies and other cool crops. For best results with Osteospermum, we recommend using a constant feed program of 200 ppm N. Maintain a pH between 6.0 - 6.2. Osteospermum flower from early spring until mid-summer. As the cool of the fall returns, the plants will flower once again. When you first receive your starter plants, transplant them into your final container and grow them another 3-4 weeks at warm temperatures. Four weeks before your desired sale dates, move them to a cool house with a temperature of 45 F and bright light. This is a process called vernalization and allows you to grow a nice compact plant due to cold temps, but which blooms widely when placed in warmer temps in the spring. Pinching is recommended 5-10 days after transplantation and your starter plants are well established in their pot. Leave 4-5 nodes in your 4” pot and 8 nodes for 10” containers. Space pots adequately to allow for light penetration and airflow between foliage of adjacent pots. We recommend 7-10” for 4 inch pots and 18-24” for 10 inch containers. Cool temperatures, proper water and fertilization, and proper pinching are the best ways to control height for these plants. If PGRs are desired, the University of Massachusetts Amherst has tested B-Nine at 2500 ppm during the first 3-4 weeks after pinching. Higher rates or sprays later in production will produce unwanted results. Whiteflies, leafminers, and thrips are the biggest pest problems with Osteospermum. Osticade Lemon are not prone to many diseases, but watch for botrytis while the days are short. This grey rot is usually associated with wet or humid conditions. You can prevent botrytis by allowing the plant to dry out between waterings, allowing for good airflow in your greenhouse, and spacing to allow the sun to penetrate to the soil level. The most common chemicals used to treat botrytis are Medallion and Banrot. Use them as a drench according to each label’s instructions. We recommend planting 3-4 starter plants per 10” basket. Use a well-drained soil in your baskets and plant your starter plants deep, allowing the ellepot to be completely covered by the soil. If you are planting 4” pots, 1 plant per pot should be sufficient if you have enough time. Plant it directly in the middle of your pot. Pinching is recommended 5-10 days after transplantation and your starter plants are well established in their pot. Leave 4-5 nodes in your 4” pot and 8 nodes for 10”. Grow your starter plants in your final container for another 3-4 weeks at warm temperatures. Four weeks before your desired sale dates, move them to a cool house with a temperature of 45 F and bright light.